Thus far in 2018 for Crypto has been a very bumpy ride. The market soared in early 2018 in January before a pretty significant crash down to earth in February. Now we’re seeing a bunch of volatility in the market on basically a day-to-day basis. Well, there are a lot of difference reasons, but probably a big one is that total market cap for cryptocurrency has declined significantly since its all time high of around 830 billion dollars. It has been as low as 282 billion this year so far and is currently sitting around 330 billion today (3-22-2018). That is a pretty significant difference in the amount of money moving around the ecosystem. Less volume, less liquidity leads to more volatility (in my opinion). Also, 2018 seems to be a year of regulation on crypto as well. The SEC and CFTC are really looking into it now and there is always some kind of discussion of Korea or China completely banning exchanges or just cryptocurrency in general. In a global market like cryptocurrency, this can lead to significant swings. I’m here for the crash prediction… so when crash? I’ve talked about the possibility of a dot-com type of crash in prior posts. I still don’t know when it’s going to happen. However, I have changed my viewpoint slightly. Previously, I thought that the crash will cause a lot of coins to go to zero, and a mass exodus of the cryptocurrency space. This is still true to a certain extent, but in a slightly different manner. So far, cryptocurrency has been a series of boom-bust cycles if you look at its short history. This series of boom-bust cycles, while looking very unhealthy, actually is probably healthy for the ecosystem as a whole. 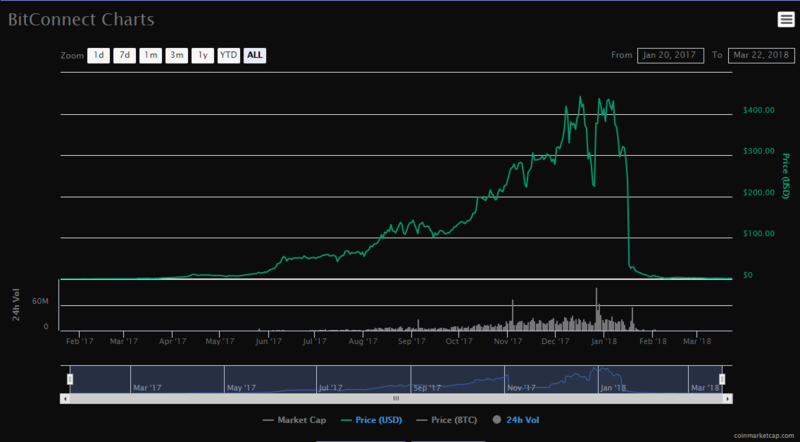 If Bitcoin had soared past $20k without going back down to $10k or $12k or so, and simply continued with parabolic growth, then that would have been even more worrisome that a bubble was developing. However, because of these boom-bust cycles, the cryptocurrency ecosystem has managed to keep its “mania” in check (for now). These “busts” have happened often enough that the sense of “I can’t lose money” does not exist in the cryptocurrency space. Whenever that sentiment even starts to happen, the “bust” happens, bringing everyone back down to earth. Basically, the boom-bust cycle has prevented Bitcoin from being a full-blown bubble (so far). I don’t think so. At least not forever. While cryptocurrency is becoming more mainstream this year, it still hasn’t reached a point where everyone is comfortable throwing money at it because of its somewhat technical barrier to entry and its “darkweb history”. This includes institutional investors as well. For this reason, I think more boom-bust cycles are still in the immediate future of cryptocurrency. Not until we see institutional investors bring big money into the space will we see other more cautious retail investors enter the fold. When your Starbucks barista or supermarket cashier starts talking to you about shorting Bitcoin at a narrow price range or buying an obscure altcoin with a tiny market cap, then the bubble may have full matured at that point. These conversations will be very specific, much more so than the dotcom era where everyone was just buying random stocks that were going up — because they were all going up. This bubble will not be like the dotcom bubble, I think it will have a slightly different tilt. Whereas the dotcom bubble was “irrational exuberance”, I think the crypto bubble will be “illusory superiority”. People in the crypto space will have gained a superficial knowledge of what cryptocurrency is and think they know it all. 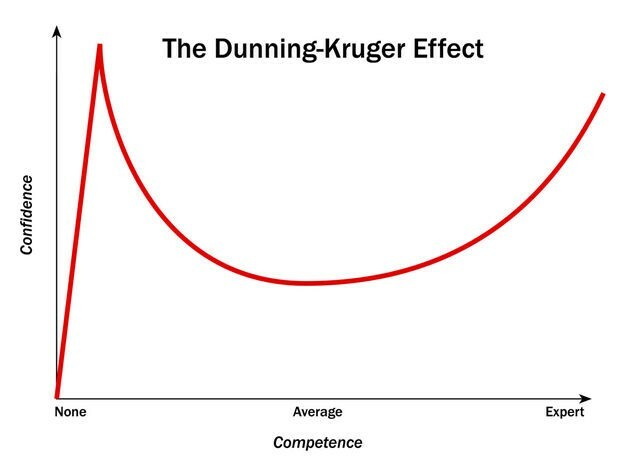 Basically, my hypothesis is that people entering the space will stay at the peak of “Mount Stupid”, which is the height of confidence despite a very superificial understanding. I am not excluding “institutional investors” from this population, which is considered “smart money”. Additionally, I am not excluding myself from this phenomenon as well. I have tried my best to learn as much about cryptocurrency as my feeble mind can comprehend. I’ve read books and I’ve watched videos. I’ve tried to decipher very technical white papers. However, cryptocurrency, cryptography, etc. is very complex stuff — the more I learn about, the more I understand I don’t know. Ok, ok, ok — so when crash? Like I said, I think the “true crash” will be sometime after institutional investors get in. It may take another year after that or so before we see a wider spread of adoption from retail investors. We need time for everyone to climb to the peak of “Mount Stupid”. Then a catalyst has to occur to ignite the event. Here’s the thing though, it doesn’t have to be huge, it just needs enough to spark a small exodus. Depending on what the cryptocurrency ecosystem is doing at the time, the catalyst could be something people perceive as “good” like Ethereum gaining a higher market cap than Bitcoin. This may cause people to move their money out of Bitcoin into what is considered the paradigm shift of crypto and make Bitcoin’s price fall. This would then lead to smaller retail investors being caught with their pants down with losses, who are over committed and will need to cash out, dropping Bitcoin’s price further. Then people will all think that Ethereum is actually taking over, and move the money they have in altcoins into Ethereum or other larger projects that are considered more stable. Here’s the thing, those altcoins which will be bleeding red won’t actually go to absolute zero, they will bleed until no one wants to trade them anymore with tiny trade volumes. It is technically still trading at $1.87 today, even though everyone knows its worthless. Its market cap is still considered $17 million because the tokens still exist, and that market cap is based on any recent trade that happened. I guess this proves people will trade anything. Keep this chart in mind though because this is what will happen for many, many altcoins during the “real crash”. 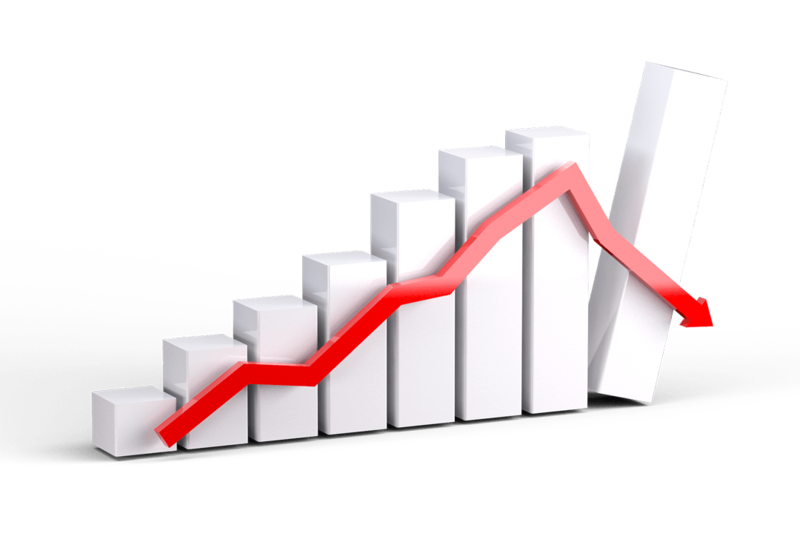 Coins that don’t have any true real world value will see volumes explode as people try to sell and then drop precipitously as the only people trading will be sellers, and not buyers. The coin itself will technically never go to $0, it will just stop trading, and anyone who still has tokens will be left with something that is worthless. By the way, this has happened already. There are altcoins which people have stopped working on and are basically no longer traded. These tokens technically are still valued at their “last trade price”, but in reality, are worthless because no one wants them. When the crash happens is dependent on when the institutional investors come into the market and when the “previously cautious” retail investors enter. From that point I see another 3-6 months of “illusory superiority” before the bubble pops. When crypto goes parabolic and seems like “it can’t go down”, then I’d be most worried. That said, the ones that do survive will be the market leaders for years to come, maybe even decades. I believe that there is an “Amazon” in there somewhere. Boom-bust cycles in crypto have prevented a “true crash” (so far). However, I still think a real crash will happen. It will just be after institutional investors and a huge influx of retail investors enter. The era of “illusory superiority” will begin, ending with a bubble pop. However, the ones that do survive will be the market leaders for years to come, maybe even decades. I am not a financial advisor and this is not financial advice. These are simply my opinions with regards to cryptocurrency. Please do your own research. Cryptocurrency is extremely volatile. Only invest what you can afford to lose.